Once you have connected your controller with the RGB strips or ribbon lights, you'll want to install the controller on your phone. 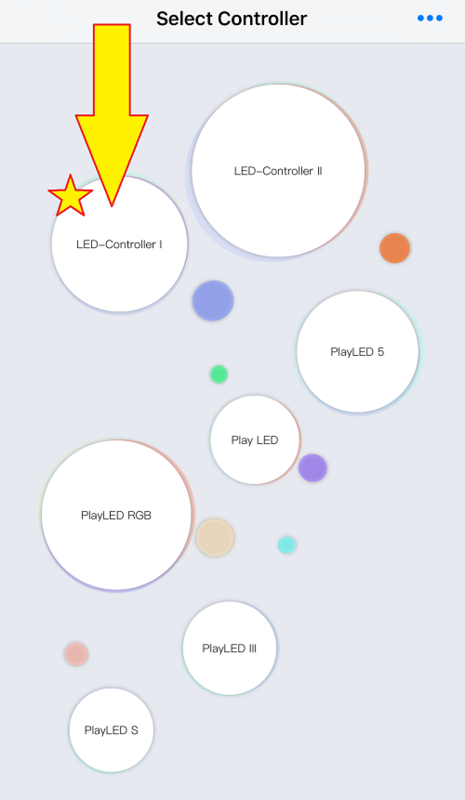 Now that you have the App downloaded, and your controller is powered on, connect your Wi-Fi settings to the "Play LED" signal. 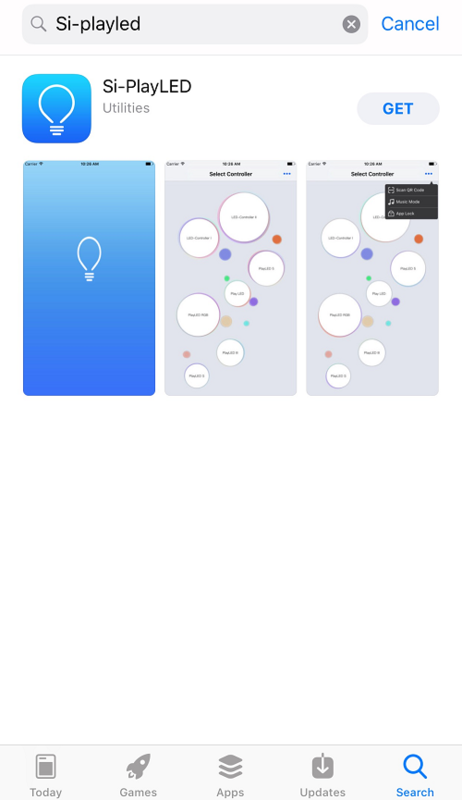 Now you can use the various functions of the App to control the lights ByHand or Gravity. You can also choose from the configured Modes or customize your own DIY Mode (up to 50 different modes in total). Touch Static Color (1.) to enter static mode: you can use your finger to choose the color and the RGB LED lights will show the light color immediately. Touch Dynamic Color (2.) to go to dynamic mode. Use your finger to slash from one point to another on the screen - the light will change the color with mix gradual effect according to the track of your finger on the screen. Touch Select Mode (3.) to go to Mode and Effect select. Four modes can be selected: Static, Jumping Change, Gradual Changes between bright and dark. 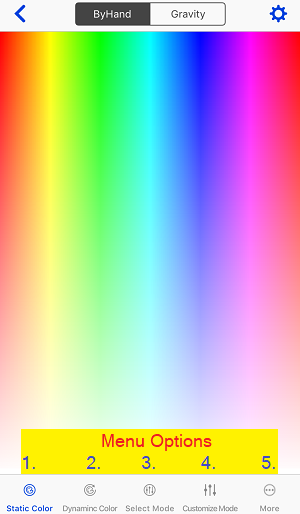 The Effect modes range from monochrome to multiple colors. Use the + symbol to add colors (up to 10), If you want to remove a color, selected it and choose the - symbol. Touch More (5.) to edit colors and access the DIY options. Choose DIY Mode to configure up to 50 modes. Select the DIY Mode number and press the + symbol in the upper right to customize it. You can then choose up to 9 colors (Clike me button) as you define the color steps under dynamic mode. The Gradual Time (GT) defines the mix gradual change time for each step. 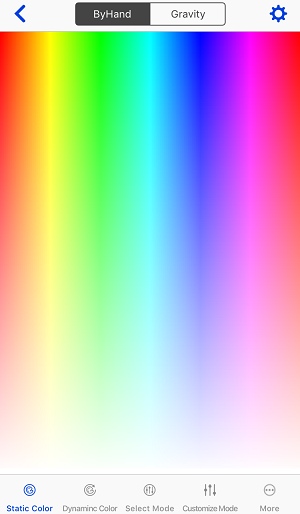 The Hold Time (HT) defines the period of each color. Every time when you go to DIY Mode Edit, first set the Max Step, for example 7, and then choose the number beneath the Step (1 to 7), then set Gradual Time (or Hold Time) and Color for each step. Please be noted that the setting of each step must be the same (except color), also when you set Gradual Time (or Hold Time), then Hold Time (or Gradual Time) must be 0. After setting choose OK to finish a DIY Mode setting. If you need to use one Apple or Android device to control multiple controllers, use your laptop to connect to the WiFi network of your controller first. Open your browser and input 192.168.2.3 as the address. Press the ENTER button to go to the controller WiFi network login interface. Input the username and password, which both are admin, then click Login and go to WiFi. Next you will change the Service Area Name/SSID to a unique name for each controller (example EngineRoom, Lounge, etc.). Restart the WIFI controller and you can now see the newly named WiFi network in your Apple or Android device. Note: you can only control one WiFi controller at a time.